If you post tuition by adding up hours in class (By Total Hours), you will create a Total Hours Fee Schedule that outlines how much you charge for each hour increment. Jackrabbit will add up the hours in class, either by student or by family, and look to the Fee Schedule to locate the corresponding fee for the number of hours. At this time, it is only possible to have one fee schedule in your database. 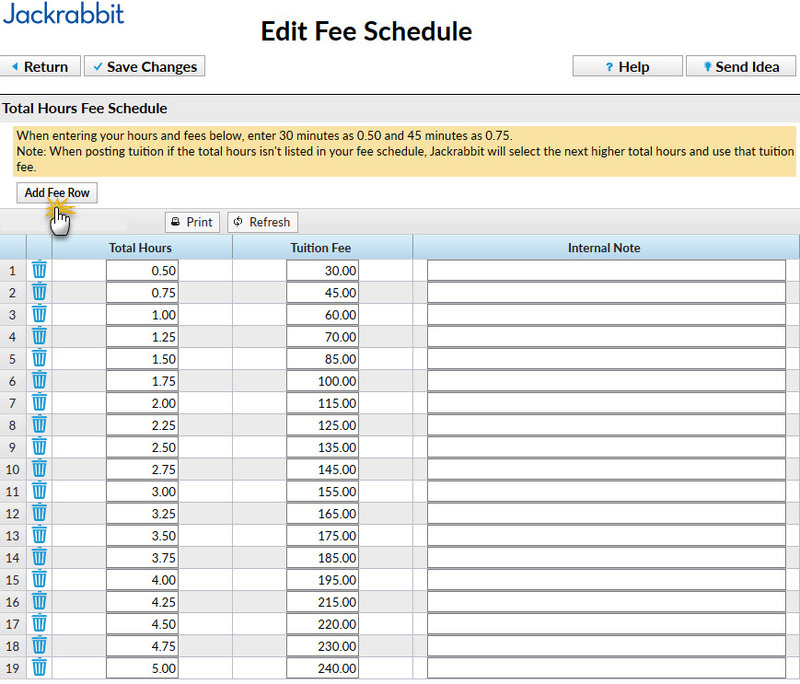 Your Fee Schedule is created from Tools > Edit Settings > Tuition Settings. Select the +Edit Fee Schedule button in the Tuition Billing Settings to create or edit your Fee Schedule. If you don't see the +Edit Fee Schedule option in your Tuition Settings it may be that your database is currently only set to use the By Class Fee Billing Method. The Fee Schedule is only available when you bill your classes By Total Hours. The Fee Schedule is based on the number of hours in class per week. It is extremely important that you set the class Tuition Fee and the Fee Schedule to reflect the rates associated with whatever Billing Cycle you've decided to use. Note: You can only use one Billing Cycle for your By Total Hours classes. When entering part hours in the Fee Schedule enter 15 minutes as .25, 30 minutes as .50, and 45 minutes as .75. When posting tuition, if the total hours isn't listed in your fee schedule Jackrabbit will select the next higher total hours and use that tuition fee.